You can see these magnificent birds opposite the Roundhouse Café at Loch Doon. There’s a viewing screen in the café so you can see all the action at close quarters plus the new viewing room is now open. Local school children named the Ospreys Angel and Cullen. Hopefully all the young will survive and return in a few year’s time to set up their own nest in the Galloway Hills. Last year only one survived, Solo, the other two were predated by a buzzard. Hills, Garden and Gorge – plus an Osprey! 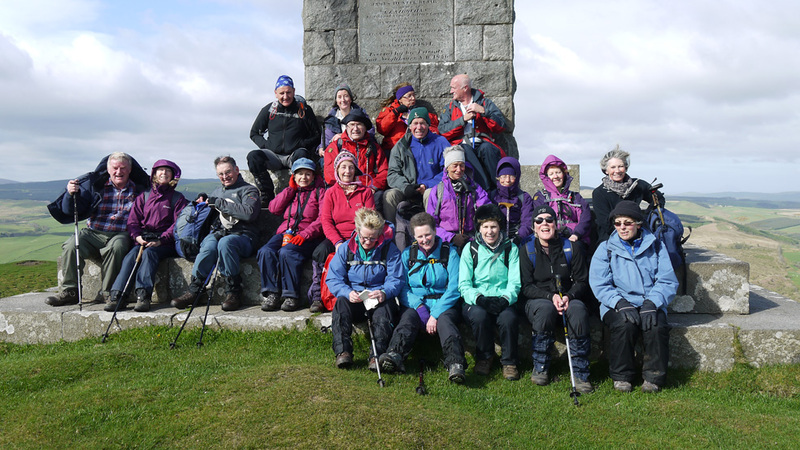 Tuseday’s walk, one of 29 organised by the Newton Stewart Walking Festival did not disappoint. Starting from Straiton 18 walkers with 3 guides tackled the Monument first getting to the top to enjoy some fine views before setting off across the moor to Auchenroy Hill. Our guide mentioning it might be “soft underfoot” which translates as “you’ll soon be up to your ankles in water”. We had good views of the Galloway Hills to the south and our knowledgeable guide told us both the ranges and names of the mountains. A pleasant walk down to Craigengillan Gardens where we had an excellent guided tour from Fi McLelland. An amazing garden, all the more interesting as it’s in the process of being uncovered. 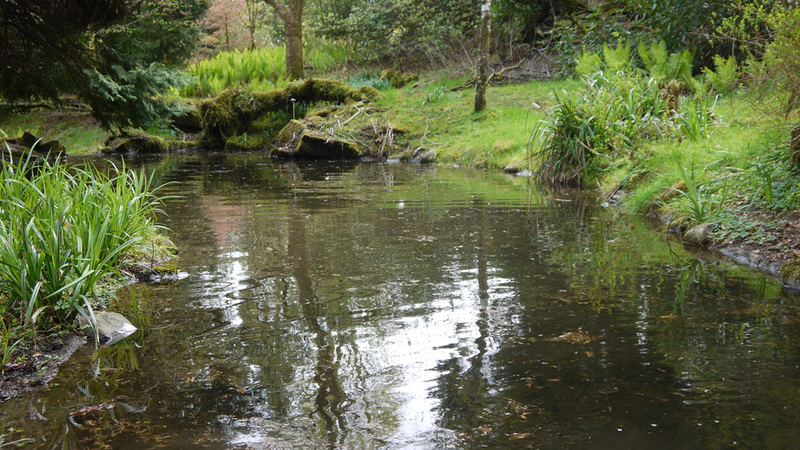 The rock garden was designed by James Pullman & Sons (usually kept busy designing for royal residences) and features pools deep enough to swim in, Peak District stone, cascades, water channels and seemingly miles of stone pathways interspersed with stone terraces. There are some stunningly beautiful trees including a 600 year old yew on the front lawn. 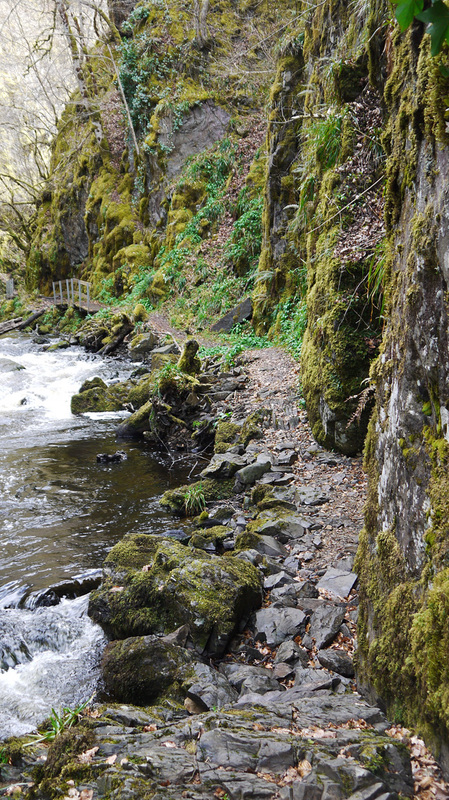 The final section of the walk was up the dramatic gorge at Ness Glen. Here the path closely follows the river as it tumbles down from Loch Doon, the steep sides are covered in an amazing variety of mosses and ferns. Towering cliffs and steep sides make this one of the best gorge walks in southern Scotland. It’s all happening over the next few days! 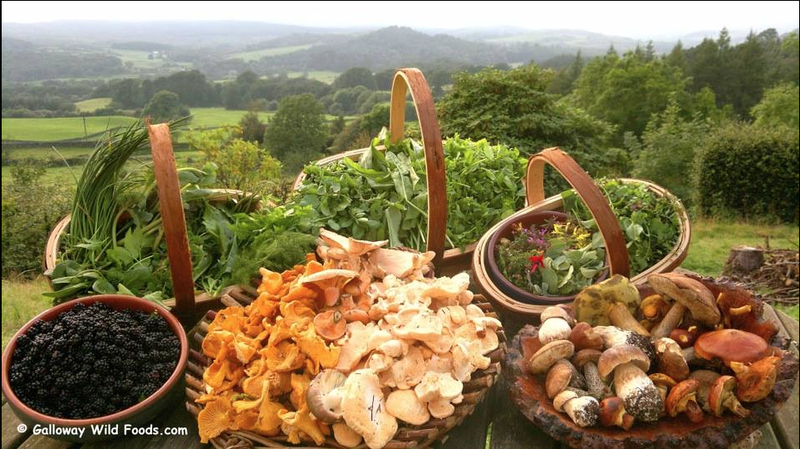 Galloway Wild Foods will be showcasing the very best of Spring wild foods with short guided walks, cookery demos, tasters etc as part of this Food Festival. 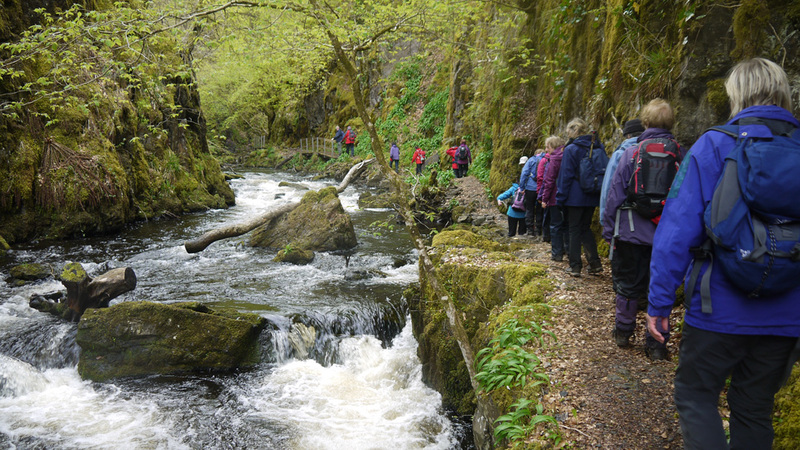 We’re spoiled for choice for activities and events over the next few days: the Newton Stewart Walking Festival has started and continues until the 15th, see previous post below for more information. On Sunday 10th the Ballantrae Food and Drink Festival runs from 12 noon – 6pm, Kirsty Wark will be demonstrating her cooking skills, there are food and drink tastings, foraging tours, pop-up restaurants, live music and an array of quality local food and drink suppliers. 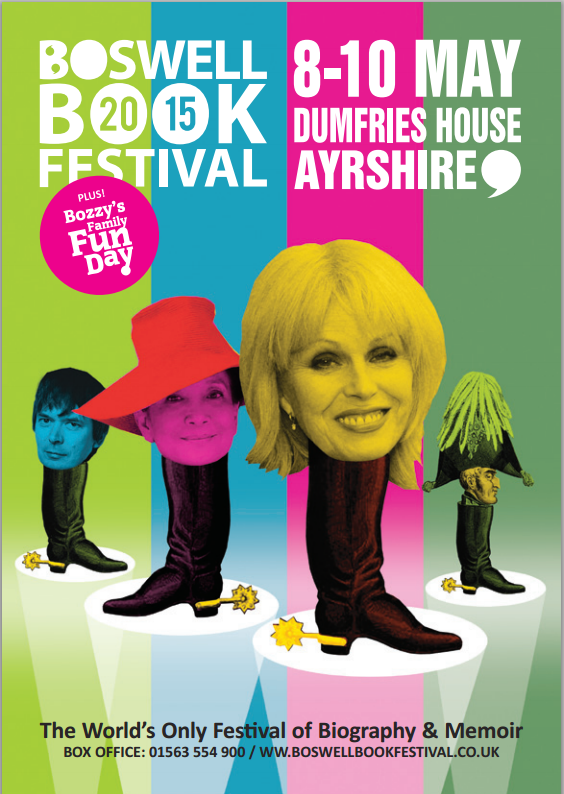 The Boswell Book Festival is being held at Dumfries House this year (8th – 10th May) and writers include Joanna Lumley, international best-selling author Jung Chang, Ian Rankin and Capt Eric ‘Winkle’ Brown. There are talks, performances, music and family fun day. Click here to visit the website for tickets and more information. Over at the Dark Sky Observatory at Craigengillan there’s a Solar Night on the 7th, 7.30pm – 11pm and on the 15th Dr Iain Hannah will be giving a talk “How’s the Space Weather Today?” after the talk there’ll be tour and, if clear, guests will be shown the night sky through the main telescope. Later in the month is an Astrophotography workshop. To book any of these events click here. 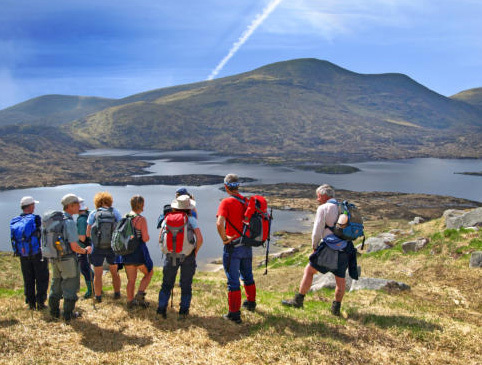 There are almost 30 guided walks varying from gentle rambles exploring pilgrimage sites in Whithorn to the challenging route along the Awfu Hand taking in the summits of seven hills. Guides are knowledgeable in history, plant and animal life which enrich the experience. Walks cost from just £5 and include transport to and from the start and finish points. What better way to get fitter, enjoy the outdoors and gain an insight into this beautiful part of Scotland? This year a new route starts from Straiton, climbs up to the Monument, follows the ridge to the Doon Valley, takes in the remarkable gardens at Craigengillan, then follows the spectacular gorge path through Ness Glen finishing at the Roundhouse Café at Loch Doon. In addition there are evening events including talks, slide shows and whisky tasting to celebrate 2015 – Scotland’s Year of Food and Drink. Click here to go to the website for more information and to book. Ospreys have been seen at Loch Doon since 2010 but, if the current pair manage to raise chicks this year, it could mean a permanent return of these magnificent birds after more than a hundred years. 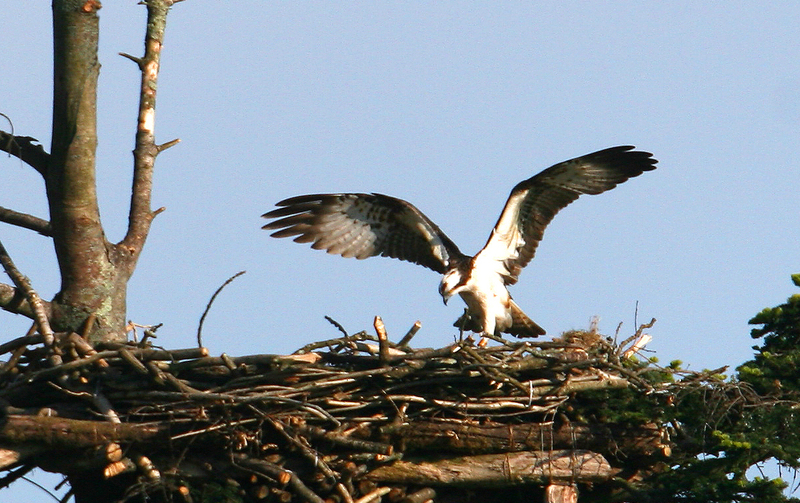 Once settled Ospreys return year after year to the same spot to raise their young. The Forestry Commission have constructed platforms in carefully selected trees and a pair has been observed building a home. Brian Meechan who runs the Roundhouse Café has set up a powerful telescope which the public can use to view the birds. Obviously it’s unwise to try to get close to the nesting area not to mention it’s illegal to approach the nest so the telescope at the Roundhouse is ideal. Apart from the opportunity to see these rare and majestic birds Loch Doon is a great place to spend the day; there’s a ruined castle to explore, beautiful spots for a picnic and several walks to enjoy. To round it off you can return via the Carrick Forest Drive which finishes at the Stinchar Falls car park, south of Straiton. To get to Loch Doon follow the A713 southwards from Dalmellington for 1.8 miles, turn right, signposted Loch Doon and Dark Sky Observatory. Continue along the single track road for approximately 2.2 miles and the Roundhouse Café is immediately after the bridge at the northern end of the Loch.